Born at Slough, Buckinghamshire on 8th April 1961, after unsuccessful trials with Queens Park Rangers and Millwall, McDermott joined Arsenal as an apprentice in January 1977 and signed professional forms February 1979. He represented England at Youth International level, with the Under-Eighteens. Then a striker, he became a regular in the Arsenal Reserve team, finishing their leading goalscorer in the Football Combination League in the 1978-79 season. He made his debut for the Arsenal first team, as a substitute against Bristol City in a 2-0 win at Highbury on 10th March 1979. He broke into the Arsenal team on a regular basis in the following season but was still referred to as "Sub" McDermott due to his many games on the bench. A pacy and industrious striker, he could also operate in midfield and, after making 16 starts in the 1980-81 season, he was given the chance to partner Alan Sunderland as striker after Frank Stapleton left the club in the summer of 1981. He was unable to maintain a regular spot after the 1981-82 season and was loaned to Fulham in March 1983, where made three substitute appearances without scoring. He was on the outer at Highbury and took the opportunity of playing a season with IFK Norrkoping in the Swedish Allsvenskan on loan in the Swedish summer of 1984. The Swedish season started in April and continued for seven months. McDermott played on the right wing and had a successful season, quickly becoming a crowd favourite. He formed a strong partnership with Janne Hellström and the club finished fifth at the end of the season, which was good enough for them to participate in the play-offs. After beating second-placed AIK after extra-time over two legs, Norrköping faced the challenge of Hammarby IF, and managed to beat them on penalties. Unfortunately the two-legged final saw them pitted against the all-conquering IFK Göteborg, who had such players as Roland Nilsson and Johnny Ekström in their side. The tie was all over in the first game as Goteburg won 5-1 in Norrkoping but the aggregate was restricted to 7-1, but it was their most successful season in twenty years, being their most successful in over twenty years. McDermott, who had scored League twelve goals and started thirty-eight League games and come on twenty three times as a substitute while at Arsenal, had returned to Highbury before the play-off final and was elected "Swedish Player of the Year". His total goals at Highbury was thirteen and came from forty-four starts and twenty-eight games from the bench. He scored six goals in seventeen appearances, while in Sweden. On his return to England, in December 1984, he signed a three year deal with Oxford United but despite his First Division experience, he soon became surplus to requirements at Oxford. He went on to another loan spell to Sweden, joining Djurgardens for six months in January 1986 whilst a United player, but there was limited success with two goals in twelve appearances. He scored twice in sixteen League games and eight games from the bench while at Oxford. He also went on loan to Huddersfield Town in October 1986, scoring once in four starts in the League, before leaving for Cardiff City in August 1987. He scored eight League goals in forty-nine starts and two games from the bench at Ninian Park, gaining promotion for the Bluebirds in 1988 when he scored direct from a corner in a 2-0 win over Crewe Alexandra at Ninian Park on 2nd May 1988. He moved to Exeter City in February 1989 and there he scored four League goals in sixty-five starts and three games from the bench, as the Grecians became champions of the Fourth Division in 1989-90. He then went into Non-League football with Conference League side Yeovil Town in November 1990 making his debut on 24th November 1990 in a 0-1 defeat at Barrow. It did not take him long to register his first goal which came on 4th December 1990 when he bagged a hat-trick in a County Cup game against Paulton Rovers with his first League goal coming on 22nd December 1990 in a 2-3 home defeat by Altrincham. He went on to score eight League goals in fifty-six starts and six games from the bench, five goals in eight starts and one substitute appearance in the Somerset Premier Cup, and no further goals in four F.A. Cup starts, five F.A. Trophy games and five League Cup games, for a total of nineteen goals in eighty-five appearances for the Glovers. He then went Hong Kong in June 1992, where he played for South China for a spell before returning to England and becoming an insurance salesman for a year. He then made a return to football in July 1995 and he finished his playing career at Slough Town in June 1996 with six appearances. The following season he became manager of Slough Town where he had two very successful seasons in the Conference, finishing sixteenth in 1996-97 and eighth in 1997-98 and reaching the semi-final of the F.A. Trophy. He left Slough as the club went into the Isthmanian League and financial constraints saw almost all players and officials leave. He became the Manager of Woking in September 1998 on a non-contract basis and took them to ninth in his first season. He could not maintain the imputus and with the club in twentieth position he was sacked on 29th February 2000. He then joined Reading as chief Scout in September 2000 when Alan Pardew was the Royal's Manager. He took coaching certificates and moved on to become Manager of the club's Under-Nineteen and then Reserve team, before he became caretaker manager after the departure of Brendan Rodgers on 17th December 2009. He signed a one year contract on 27th January 2010 as Reading's Manager. He took Reading to the 2010-11 Championship play-offs, where they were beaten in the final by Swansea City. After a poor start to the 2011-12, on 17th April 2012, with a 1-0 home win over Nottingham Forest, Reading won fifteen of their last seventeen games to gain promotion to the EPL as Champions. On 14th May 2012, McDermott was named as the League Managers Association Championship Manager of the Year. Reading again made a poor start to their season, but on 6th February 2013, McDermott was named Premier League Manager of the Month for January after guiding his side to victories over West Bromwich Albion and Newcastle United and a hard-fought draw with Chelsea., but despite this, McDermott was sacked on 11th March 2013 after a run of four successive league defeats. 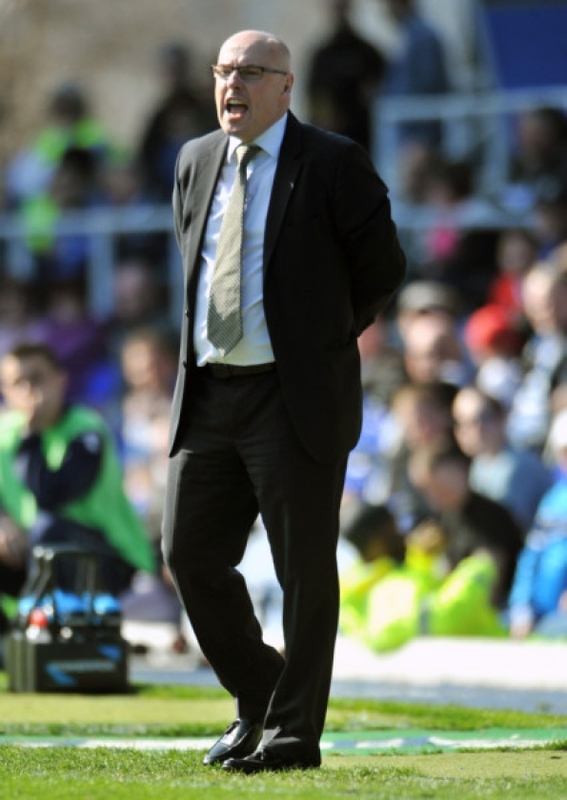 Following the departure of Neil Warnock on 1st April 2013, McDermott was appointed Manager of Leeds United on 12th April 2013 on a three-year contract, with his Assistant Manager, Nigel Gibbs, also joining him at Leeds. He was in charge as Leeds defeated Sheffield Wednesday and Burnley in their first two games and dis-spelled any lingering doubts of the club's relegation. McDermott was generally popular with the fans, who had to put up with the inconsistency of the team and the instibility of the owners and financial backing. It was felt that despite the instability he was making good and for a while the club had thoughts of a play-off place with the club sat in fifth spot at Christmas, but a run of five defeats, including an ignominious exit from the F.A. Cup at the hands of lowly Rochdale saw those thoughts vanish. This co-incided with the take over of the club by Massimo Cellino and there was the sad spectacle of no one knowing what was was going on as the potential new owner requested that the former Middlesbrough defender Italian Gianluca Festa should sit on the bench for the game with Ipswich Town in a 1-1 draw at Elland Road on 28th January 2014. It transpired that the takever had not yet been completed and McDermott sought clarificaton of his position. Three days later it was reported that McDermott was no longer Manager and there was speculation that Festa would replace him. With the takeover remaining incomplete, the owners, Gulf Finance House Capital, asserted Cellino had no right to sack McDermott and that he should be re-instated. On 1st February 2014 the club announced that McDermott's assistant, Nigel Gibbs would be caretaker manager for the home game with Huddersfield Town on that day. The fans made their feelings know by chanting McDermott's name. After the game, the club released an official statement stating that McDermott had not been dismissed and remained in charge. McDermott returned to take charge of the first team training after on Monday 3rd February 2014 stating he did not want to leave Leeds and never had and would return despite the uncertainty of the position of the potential new owners. On 7th February 2014 it was announced that the change of ownership had been finalised. Jack Butland and Connor Wickham were brought in on loan to boost United's playing strength but the season petered out to an uninspiring end with United in a disappointing fifteenth position. On 28th April Cellino said of the former owners' employment of McDermott "They should have said to him that there is no money because he is not a magician" Adding "It was all wrong the way that he came here. They were not straight with him. They forced him to be somebody that he wasn't and that he never wanted to become. I have to treat him with respect because he is a nice man and a good coach and has tried to do the job. We have to talk but we have much bigger problems than his future." He went on to say that he planned to bring in former Sheffield Wednesday, Aston Villa and Bradford City forward Benito Carbone to work with the club's academy, saying "We have a lot of things to do and we need to start from the bottom again with the academy, Benito will rebuild the academy with my help. I will not accept the philosophies they have there at the moment because I don't like them - people must accept my conditions." He continued "The club must be healthy again before we can be promoted. People before were throwing money out of the window and just hoping to get to the Premier League to save the club's finances. We have to fix the club's illness and then after that we can focus on going up." He concluded "We have a lot of things to do and we need to start from the bottom again with the academy," he said. On 15th of May 2014 the club announced "The club are delighted to announce that Benito Carbone has joined the club in a consultant position and will deal with technical and football operations". It was subsequently revealed that he would be involved with all football matters, including both the first team and the Academy. The writing was clearly on the wall and on 30th May 2014 McDermott left the club, supposedly by "mutual consent". Cellino had made it clear that he and Carbone would be in charge of the management of the administration of the playing side of the club and this was borne out when David Hockaday was appointed on 16th June 2014 to replace Brian McDermott, being given the title of "Head Coach". On 6th October 2014, McDermott joined Premier League side Arsenal as chief scout, a position he held until until 17th December 2015 when, after weeks of speculation, he returned to his former club as he took the Reading manager's job, which was vacant after Steven Clarke had been sacked. He signed a two and a half year contract, but when he could not produce the results he had previously achieved at the Madejski, he was sacked on 27th May 2016.